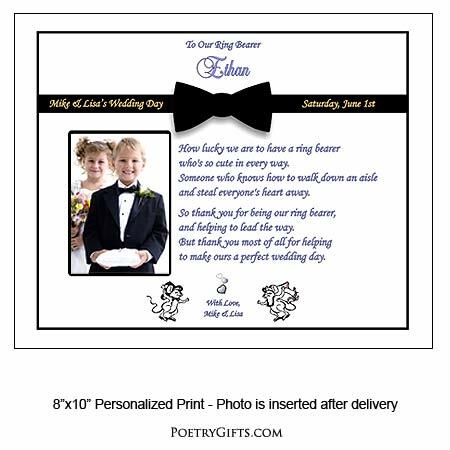 Ring bearer gifts personalized with names, wedding date and photo area. 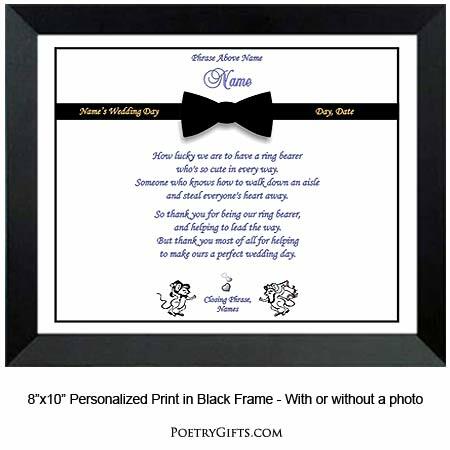 Bow-tie design with cute cartoon "bride and groom dancing mice." Unique keepsake for the ring bearer from the bride and groom thanking him for being in the wedding party. Wonderful way to display a photo from the wedding. A unique Ring Bearer gift to thank him on your wedding day. Perfect gift for the ring bearer no matter what age he is. Give the gift at the wedding rehearsal dinner, on your wedding day, or a gift when you receive your wedding photos. Frame it yourself in any standard 8" x 10" frame or let us frame it for you in either our modern black frame or classic silver metallic frame. 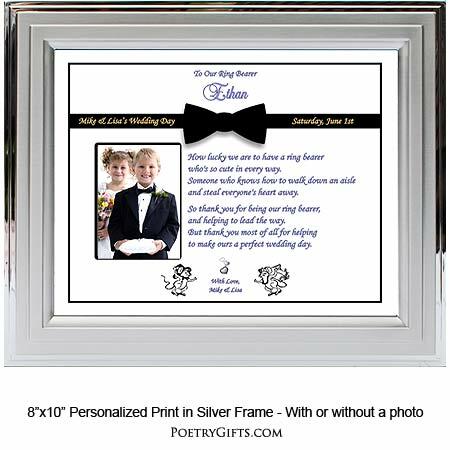 It's a wonderful way to thank your ring bearer and give him a keepsake to remember a very special day. 4. Closing Phrase and Your Name(s) (as seen after poem) - (Examples: We Love You, Justin & Katie; xoxo Brandon & Laura; etc.)" 5. Phrase and Wedding Date as seen in the bow tie and written in gold colored type - (Examples: Brandon and Laura's Wedding Day - June 15th; Justin & Katie's Wedding - October 5th)"